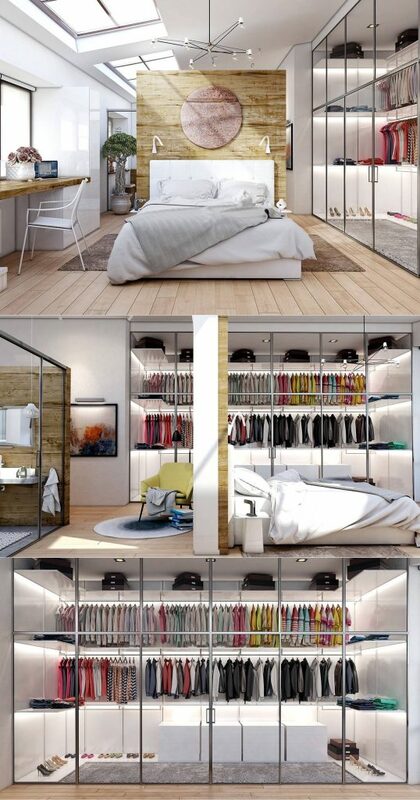 Some homeowners decide to put their wardrobe or closet in separated room next to their bedroom. But the others want to attach their wardrobe or walk in closet in their master bedroom. You’re here since you’re interested in the second way, attaching your walk in closet or wardrobe in your master bedroom. So, we would love to share several incredible inspirations about designing a master bedroom complete with the attached walk in closet. Scroll down and enjoy the ideas. A master bedroom usually is completed with a master bathroom. If you’re planning to complete your master bedroom with master bathroom and walk in closet you may want to consider sliding glass doors for both master bathroom and walk in closet especially if your master bedroom has limited spaces. The glass door for master bathroom behind the bed and the glass door of walk in closet beside the bed won’t make your bedroom feels tight. Just make sure you keep your bathroom clean and your wardrobe organized. Having glass door seems to be interesting to be adopted into a bedroom. 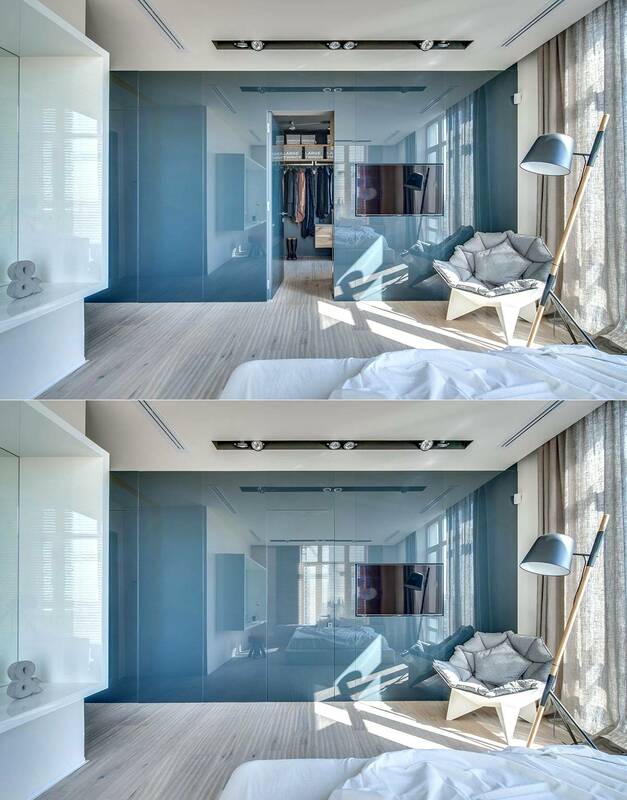 If you like the idea of glass doors but you don’t want to expose everything inside your walk in closet, consider frosted doors or smokey doors that won’t make your master bedroom feels small and tight but also will not expose your clothes and everything inside the closet. This idea is great since your frosted doors will not block the lights and won’t make the room looks dark. Try something mysterious like the hidden gorgeous walk in closet. This closet door idea is perfect for bigger master bedroom, yet it does not mean this will not work for smaller one. 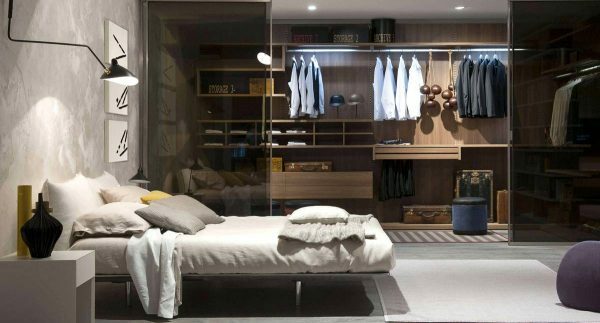 Make a walk in closet beside the bed and cover it with something that makes the walk in closet looks like a wall, and then add a door with invisible handle between the closet walls. For even smaller bedroom a simple open wardrobe right behind the bed is a nice choice. 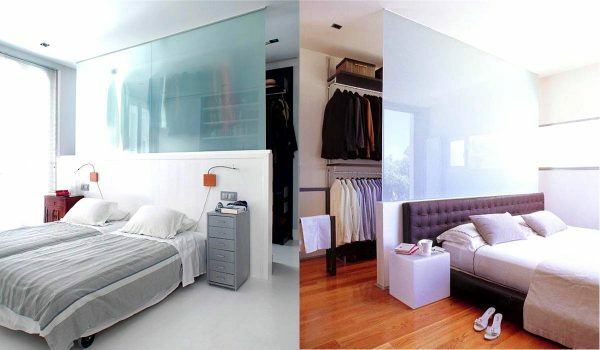 Put the wardrobe right behind your bed with frosted wall divider to separate the bed from the wardrobe. Access this wardrobe from the spaces beside the bedside tables; there is no need to add doors. The idea above belongs to smaller bedroom. 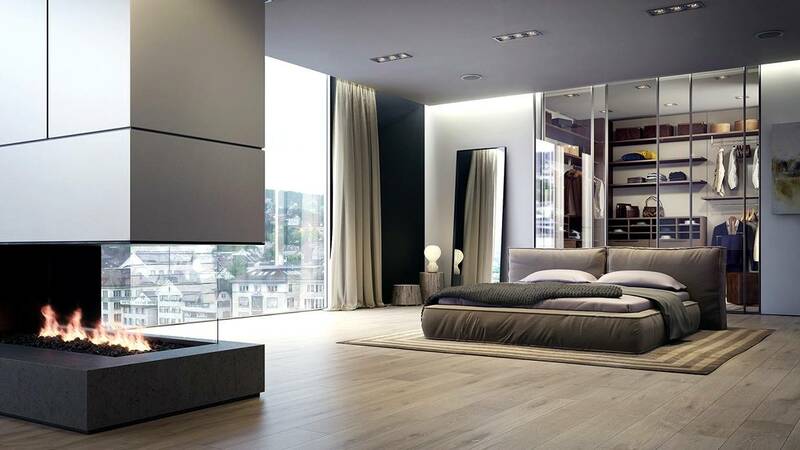 If you have a bigger bedroom but you want similar wardrobe idea consider creating wardrobe behind your bed but add some spaces between the bed and the wardrobe so you can walk between them. Then use clear glass for the wardrobe sliding doors. 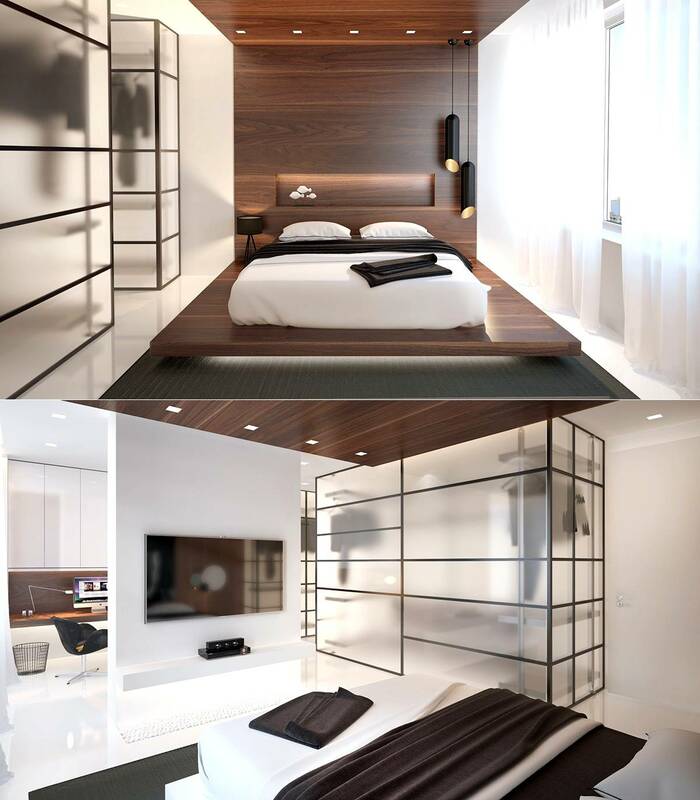 Or, you can use mirror doors for the wardrobe to make the room seems more spacious. For everyone who lives alone, an opened closet is a perfect choice for master bedroom. Opened closet right beside the bed with no doors allow the homeowner to grab everything he needs when he is in hurry in the morning. This one is more suitable for men than women since women usually are organized and have enough time in the morning to make their appearance looks perfect. When designing a walk in closet or a wardrobe inside a master bedroom, homeowner must consider the interior style of master bedroom. If the entire walls have grey color, clear glass doors for the walk in closet will look weird. So, for dark themed master bedroom homeowner must consider using dark colored glass doors for his walk in closet that matches the dark accent of bedroom’s grey walls. But if the master bedroom has wonderful neutrals including white for the walls and for the lampshades of the desk lamps and khaki for the rug under the brown wooden bed, white framed clear class doors for the walk in closet beside the bed is a brilliant choice. The white frame blends well with the incredible neutrals in the room. 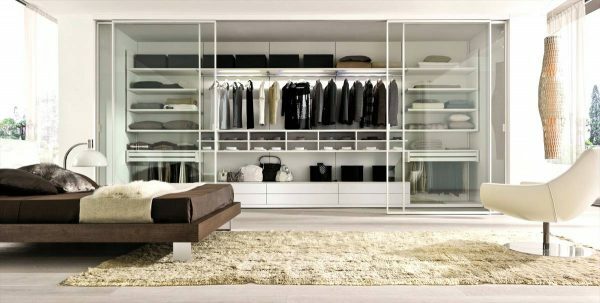 Homeowner of the last wardrobe or walk in closet that is attached in master bedroom above must keep their closet clean and organized since the scattered clothes inside the walk in closet with clear glass doors will be exposed and then decrease the splendor of the master bedroom. Which attached walk in closet idea do you want to try?